Repetico is a smart index card solution that allows you to finally transfer your knowledge into the long-term memory. Learn languages, definitions, formulas and much more with the help of Repetico. You can create your own index cards, buy quality-tested index card sets from specialist publishers or learn cardsets created by other users - even if you do not have a mobile internet connection. By this way you can on learn while being on the bus, in the train or outside in the fresh air and repeat your index cards. What is the basic idea behind Repetico? Repetico is based on the Leitner algorithm. The basic principle of this algorithm is that information is repeated at different times in order to be able to remember it in the long term (also called distributed repetition system). 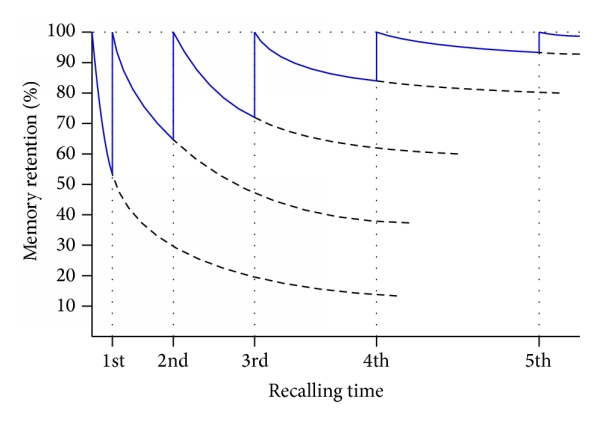 The system of distributed repetition is a reminder method based on the forgetting curve of Ebbinghaus (see picture). Many see it as one of the most efficient methods of vocabulary learning. The method assumes that information must be regularly repeated in order to be anchored in our long-term memory. Here is no arbitrary time meant, but there is an ideal time for repeating the learned. If you repeat too early, you lose unnecessary time; If you repeat too late, you have already forgotten and you have to learn again. Actually, the best time to repeat is when you're about to forget something. This time is of course not easy to determine. In addition, it varies from person to person and depends on the noted information. Can I adjust the time intervals in my learning plan? Of course, you can adjust the time intervals individually to your needs. At the top left you will find the possibility to adjust your desired time intervals. What does the name Repetico mean? Repetico is an English word combination of repetition and collaboration. Which advantages does the online learning plattform Repetico offer me in comparison to paper flash cards?? 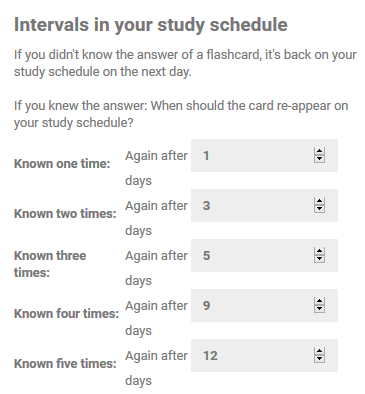 - Automatic resubmission of your flashcards: Repetico remembers you for each flashcard, based on the time and outcome of your last learning session and gives cards to repeat based on scientifically proven intervals. - You can create flashcards with your friends. - You always have it with you and can even learn offline with the app "on the go"
What can I learn using Repetico? You can learn languages, definitions, formulas, and more with this app. Everything that can be displayed on an index card.